Aslan summons Eustace Scrubb and Jill Pole to the land of Narnia, and sends them to rescue a Narnian prince. Their mission will bring them face-to-face with a deadly and beautiful evil. It was a dull autumn day and Jill Pole was crying behind the gym. She was crying because they had been bullying her. This is not going to be a school story, so I shall say as little as possible about Jill’s school, which is not a pleasant subject. Narnia … where giants wreak havoc … where evil weaves a spell … where enchantment rules. Aslan summons Eustace Scrubb and Jill Pole to the land of Narnia, and sends them to rescue a Narnian prince. Journeying to the wild lands of the north, the friends and their companion Puddleglum battle mighty storms and encounter a race of giants who like nothing better than a tasty snack–of human children! 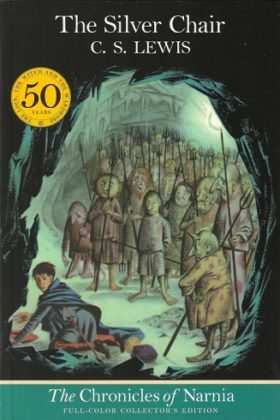 Searching deep underground in the grim land of the Earthmen, they encounter the wicked Green Lady who has evil plans to overthrow King Caspian and become Queen of Narnia. Book 4 in The Chronicles of Narnia series.